I last wrote about David Lodge in 2009 when I reviewed his novel Deaf Sentence. Looking around in a bookstore recently I came across a new edition that collects my three favorite Lodge novels of academia. So with college graduations so recently in mind these seemed like a great summer reading opportunity. 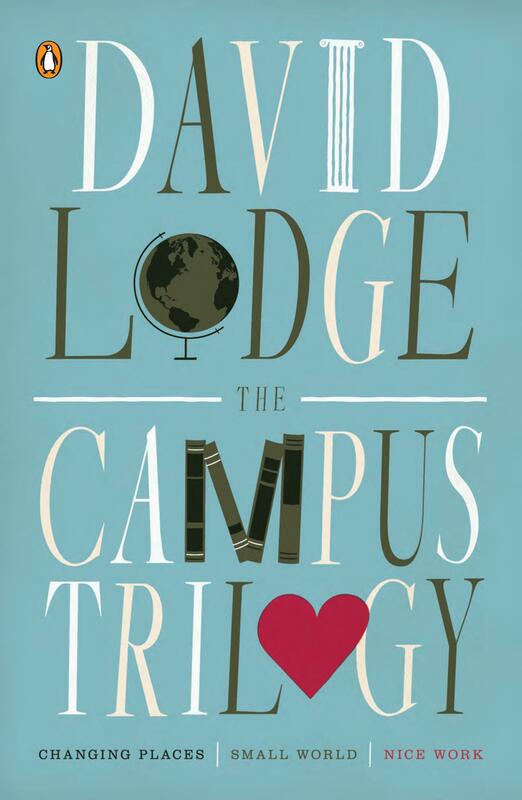 The Campus Trilogy, collects Changing Places, Small World, and Nice Work, which are three of the funniest and most pointed satires of campus and academic life I have ever read. Changing Places introduces the reader to Morris Zapp, all-star American professor in the English Department of the State University of Euphoria in California and to Phillip Swallow, a somewhat less successful professor at the University of Rummidge, in England. The two are part of an exchange programs and as we meet them, they are on passing flights over the Atlantic, heading for a six-month teaching position at each others’ campus. The campus turmoil of 1969 affords Lodge a lot of targets for satire, and he makes the most of them. But it is not all barbs. There is a lot of humor here that is not pointed and sharp, and the responses of both Zapp and Swallow to their new situations raise some interesting questions about the human condition. Lodge followed this novel with Small World, a raucous novel set at a variety of literature conferences, and featuring many of the characters from Changing Places. Zapp and Swallow are back, as are their wives, and a host of new, and equally superb, characters from English departments around the world. Lodge is playing with romance and the Grail legend here, as one of the main story lines follows the romantic aspirations of Persse McGarrigle, a poet and lecturer at the fictional Limerick University, Ireland. Despite the complex plot and almost Russian-novel cast of characters, Lodge pulls all the strings together at the end with all the main characters attending the annual Modern Language Association conference in New York. The final novel in the series, Nice Work, is more of a stand-alone work, though it is set at the University of Rummidge, where Swallow is heading up the English Department, and Morris Zapp does make an appearance. Here, Lodge takes a narrower focus though, following the lives of Victor Wilcox, Managing Director at a local engineering firm, and Rummidge U. professor Robyn Penrose, a feminist scholar, who is assigned to shadow Wilcox as part of a university project to better understand the commercial world. Lodge wields a gentler pen here, though there the satire is still amply present. The novel does raise questions about how we talk to each other, and what the role of the university is in the modern world, a debate that continues to be timely in this ear of budget cuts and calls for more oversight of colleges and universities. All together, Lodge’s three novels make a delightful, humorous, and thoughtful summer reading opportunity. Unreliable narrator? Check. Quirky characters? Check. Fish-out-of-water? Check. Funny scenes? Check. The Rosie Project manages to push all these buttons, plus add a semi-sweet love story, a bit of a mystery and some academic humor. No wonder it’s been a surprise international hit for debut author Graeme Simsion. Don Tillman is a genius geneticist, the kind who makes other genius geneticists (and geniuses of all other specialties) look like…well, like me. Part of his success is an ability to focus on the work at hand; part of it is an eidetic memory; part is a determination to win at anything he turns a hand to. But those qualities also add up to an inflexible loner, probably with Asperger’s Syndrome and no idea why he never has a second date. Stymied by women who smoke, who are never on time, who eat apricot ice cream, are adamant vegetarians, or show any conflicting values, Don decides he’s going to weed out those who are demonstrably unsuited for him. His method? A 16-page questionnaire covering every conceivable idiosyncrasy that might affect his ability to be around that person. One of Don’s test subjects is Rosie Jarman, a barmaid, smoker, chronically late, pretty and opinionated young woman. Obviously not a match for Don on any count. However, she presents him with a puzzle he cannot resist—the opportunity to collect DNA from a limited but scattered population to find her natural father. The technical part is easy, but he’s intrigued by the difficulty of finding the subjects. Thus begins the Rosie Project. Simsion perfectly captures the interior voice of a man with Asperger’s, and in multiple comedic scenes demonstrates why Don doesn’t get along with those who are conditioned to follow social conventions (as he sees it), or those who have learned to interpret the myriad of clues that lubricate social interaction (as everyone else sees it). The Apricot Ice Cream Disaster, the Jacket Man Incident, the Pig Trotter’s Disaster, the Flounder Incident, the Bianca Disaster, the Aspie Lecture—all point to Don’s seeming inability to function in public. But gradually, and in small ways, Don learns to look for and interpret, and finally to empathize with, distasteful human emotions. If this sounds like a formula Hollywood script, it’s because it started as one (a script, that is), but Simsion realized that dialogue alone wasn’t enough to portray Don without making him an object of ridicule. 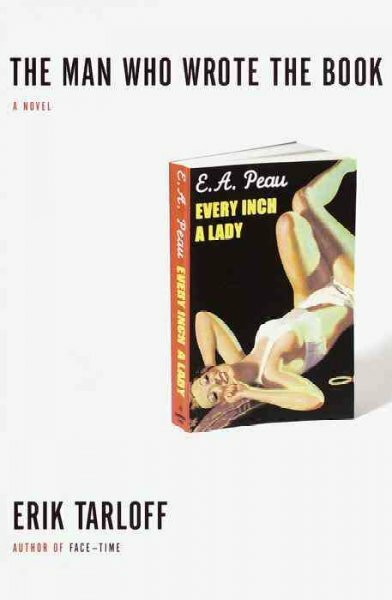 The result of his move to the novel form is a romantic comedy with depth and original characters, and an unsympathetic narrator we quickly come to cheer for. It comes across initially as a light read, but I think readers will remember Don Tillman for quite a while. Check the WRL catalog for The Rosie Project. Character is at the center of all of Michael Malone’s books, and his academic novel Foolscap is no exception. Theo Ryan, son of semi-famous singers, teaches English (what is it about English departments that attract the attention of fiction writers?) at a small college in North Carolina. Here, a fascinating cast of characters surrounds him, including a Marxist English professor who insists on having a pool in his university-supplied house. As so often happens in a Malone story, Theo leads a fairly normal existence until his life takes a sharp turn when he meets Joshua “Ford” Rexford, a hard drinking, womanizing, Pulitzer-winning playwright. Theo is working on Rexford’s biography, and trying to keep Rexford alive despite his propensity for alcohol and fast driving. But Rexford betrays Theo’s trust, fleeing from North Carolina to England with one of Theo’s graduate students and the only copy of a play that Theo has written. Theo breaks out of his staid existence as he pursues Rexford, gets his play back, and achieves a reconciliation of sorts with the playwright. Theo’s play, written as if by Sir Walter Raleigh near the time of his execution, raises fascinating questions about the artistic voice. What does an artist do if his inner vision compels him to work in an earlier style? Can a contemporary painter use the techniques and narrative tools of the Old Masters in the 21st century without being dismissed as derivative or a slavish copier? Malone excels at the picaresque, and Theo’s adventures in forgery, negotiating with publishers, and tracking down the errant playwright all bring both laughter and tears. 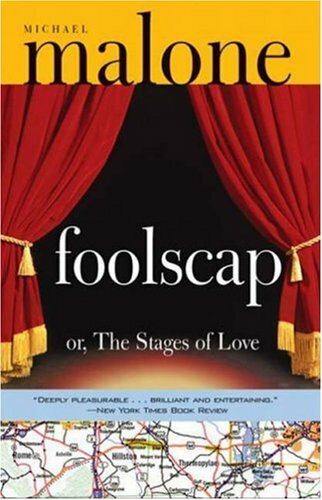 But it is this blend of humor and deeper questions about what it means to be a creative artist that gives Foolscap its enduring grace. Richard Russo is a writer whose affection for his characters and whose blend of compassion and humor draw me in on every reading. Russo populates all of his stories with people whom you would like to know, and there are no stereotypes here. Each person is fully realized and the humanness of the characters is reflected in their flaws as well as their strengths. I am always interested in fiction set in the academic world. Russo sets his academic novel Straight Man at a fictional state university, in this case in rural Pennsylvania. Hank Devereaux has taken the reins as Chair of the English Department, and finds himself at odds with both his friends and his enemies over proposed budget cuts that it is believed will require layoffs. Everyone thinks that Hank has created a list of who will get a pink slip. Fortunately, Hank is a man of cheerful disposition, perhaps too much so. His colleagues, superiors, and friends all accuse him of not taking life seriously enough, and Hank’s lack of seriousness gets him in trouble when in a fit of inspired lunacy he threatens to kill a goose at the campus pond if the English Department budget is not approved. Straight Man is filled with laugh-out-loud moments. But it also is a touching portrayal of Hank’s coming to terms with difficult aspects of his life— his failure to write a follow up to a successful first novel; his chilly relationship with his distant father, an academic superstar; the loss of passion in his own marriage; and his growing old. 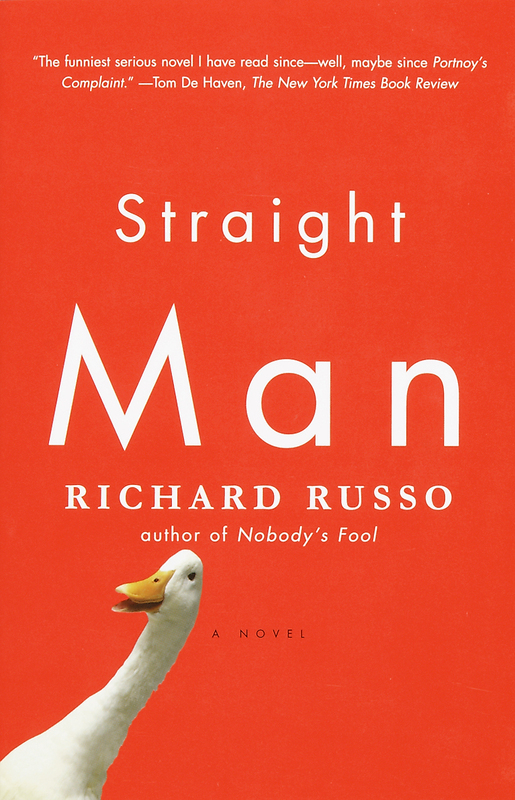 Like all of Russo’s books, Straight Man is filled with interesting and fully realized characters. Hank’s colleagues, the students, and the townsfolk are all lovingly portrayed, and it is this skill at developing characters that brings me back to Russo time and again. My daughter started college this week, and I start teaching a class for Catholic University’s graduate program in Library Science next week. So, I find myself thinking of books about school and academics. There are a lot of fascinating works of fiction set in academia. They are often funny, satiric, and thoughtful in equal measure. Here are some of my favorites. Other favorites? Add them in the comments.